The thing that initially attracts most people to Tourbuzz is our collection of beautiful tour designs. These showcase your photos cleanly and smoothly, and look great out of the box, but they can also be customized to match your branding, or the agent's, and can offer different functionality based on how they are set up. In this article, we'll take a high overview of all our designs, but we'll link to pages that go more in depth on each one. 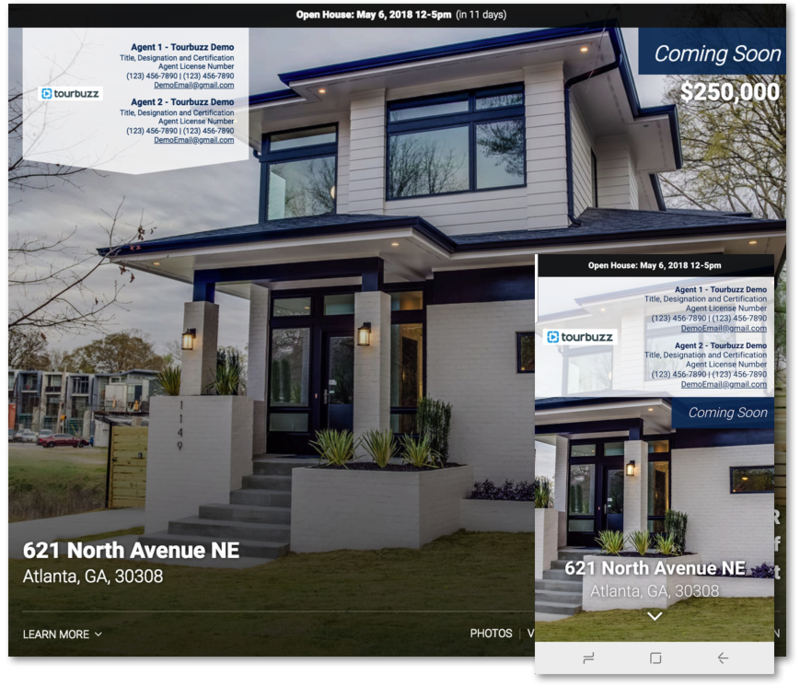 Lattice is a single-page property web experience that allows you to market a property with a website look and feel. 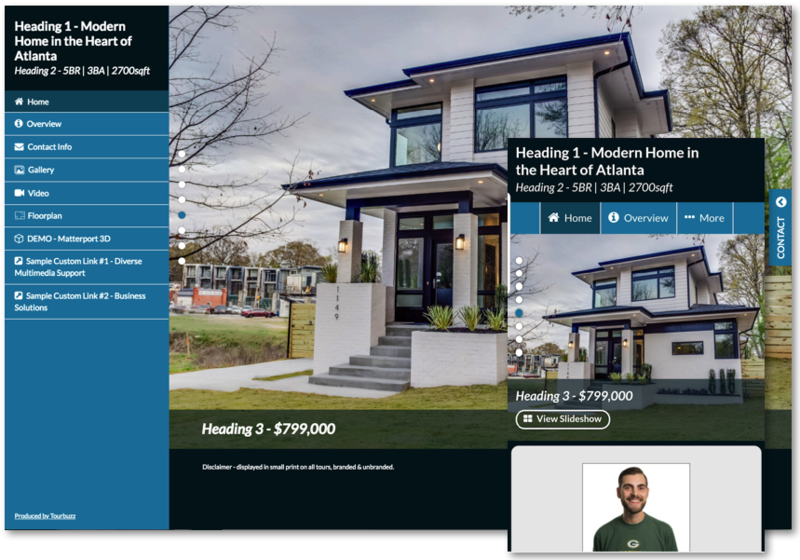 Lattice provides a modern, sleek, single property marketing website experience, with agent branding right at the top. We understand the modern home buyer needs more than stimulating images to drive interest in the home. Other factors, such as schools and businesses within walking distance, are an example of how integration between data and beautiful imagery can deliver value. Lattice seamlessly blends these needs together in an easy to consume presentation that is responsive and mobile friendly. 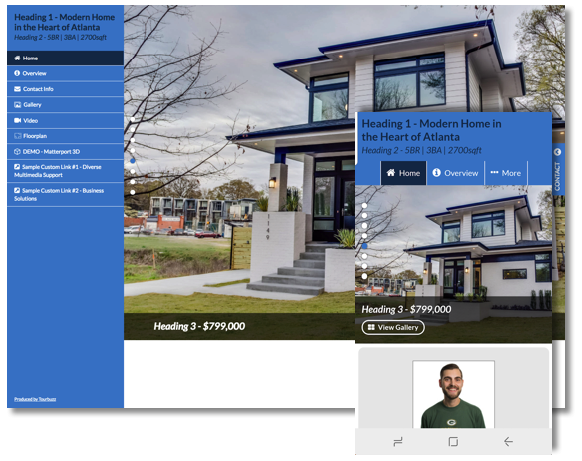 Silk is a single property web experience that allows you to market a property with a website look and feel. Silk provides a modern, sleek, single property marketing website experience. We understand the modern home buyer needs more than stimulating images to drive interest in the home. Other factors, such as schools and businesses within walking distance, are an example of how integration between data and beautiful imagery can deliver value. Silk seamlessly blends these needs together in an easy to consume presentation that is responsive and mobile friendly. Zephyr a timeline based tour. It provides a modern, sleek, experience, while presenting all media in a time line fashion. We understand the modern home buyer needs more than stimulating images to drive interest in the home. Other factors, such as schools and businesses within walking distance, are an example of how integration between data and beautiful imagery can deliver value. 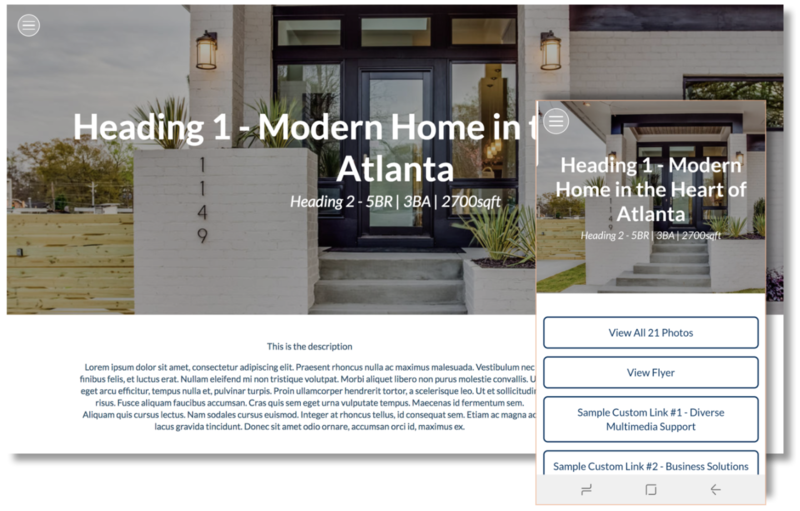 Zephyr seamlessly blends these needs together in an easy to consume presentation that is responsive and mobile friendly. We understand the modern home buyer needs more than stimulating images to drive interest in the home. Other factors, such as schools and businesses within walking distance, are an example of how integration between data and beautiful imagery can deliver value. Vignette seamlessly blends these needs together in an easy to consume presentation that is responsive and mobile friendly. 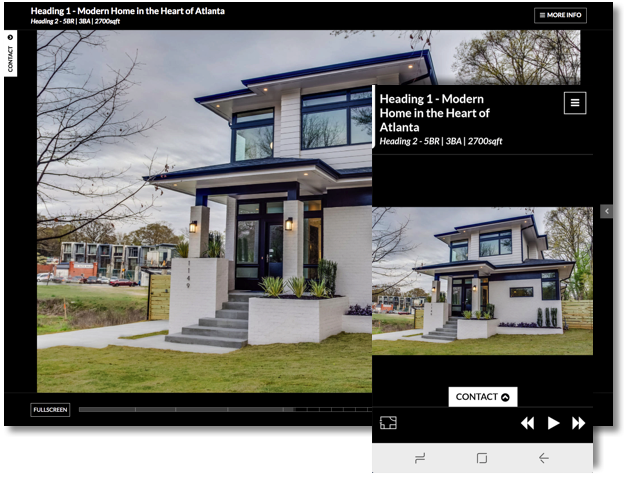 Crisp is a single property web experiences that allows you to market a property with a website look and feel while separating your different media types for individual attention. It provides a modern, sleek, single property marketing website experience. 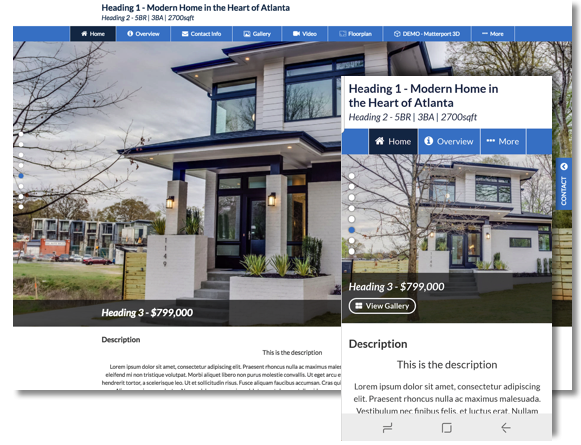 Sidebar is a single property web experiences that allows you to market a property with a website look and feel while separating your different media types for individual attention. It provides a modern, sleek, single property marketing website experience. We understand the modern home buyer needs more than stimulating images to drive interest in the home. Other factors, such as schools and businesses within walking distance, are an example of how integration between data and beautiful imagery can deliver value. Sidebar seamlessly blends these needs together in an easy to consume presentation that is responsive and mobile friendly. 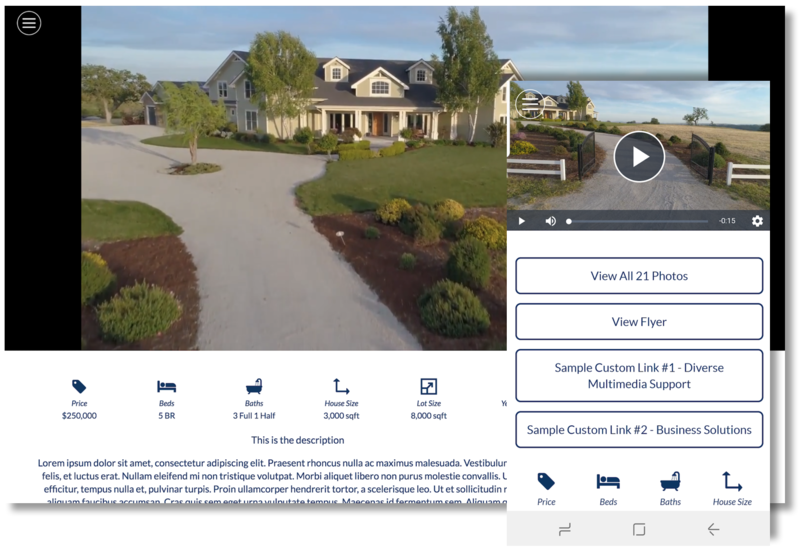 Twilight is a single property web experiences that allows you to market a property with a website look and feel while separating your different media types for individual attention. It provides a modern, sleek, single property marketing website experience.